Discount Magic - Tally-Ho Viper Deck (Fan Back). You'll marvel at the feeling that spreads in your hands when you crack the black seal on your first deck of professional Viper Cards and spread them. Enter a new world of handling and card performance. Witness the luxury of being and staying ahead of the rest, by using the new Viper Deck to accomplish true card magic. Begin with an ordinary Tally-Ho Deck, reverse image it and then change all that is white and red to a metallic matte silver. Then give the deck the power-handling UV500 Air-Flow Finish created by Ellusionist strictly for magicians and flourishers and you've got the most exclusive and beautiful deck of cards in the world. 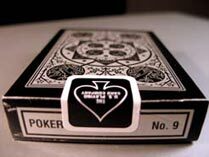 The Viper Deck is so elegant and slick that when you first see it you picture a gentleman riverboat gambler, tall and powerful, dressed in the finery of the day, sitting at a card table dealing his cards and simply winning every hand. There is nothing like Viper in the world, yet it maintains familiarity with the same distinguished markings as a normal Tally-Ho Fan Back Deck. It's long been thought that Tally-Ho brand was the highest quality card in the world. Enter the Viper. "Awesome cards! The cards themselves are like a dream. The fresh ink never smelled better! I never liked the idea of the red pipped cards on the Tigers, but on the Vipers, they look wonderful! The silver is 100% better than the white that was on the Tigers. They literally shine." I got these as a present and i would argue that they nearly ..
Tally-Ho Viper Deck (Fan Back) You'll marvel at the feeling that spreads in your hands when you crack the black seal on your first deck of professional Viper Cards and spread them.